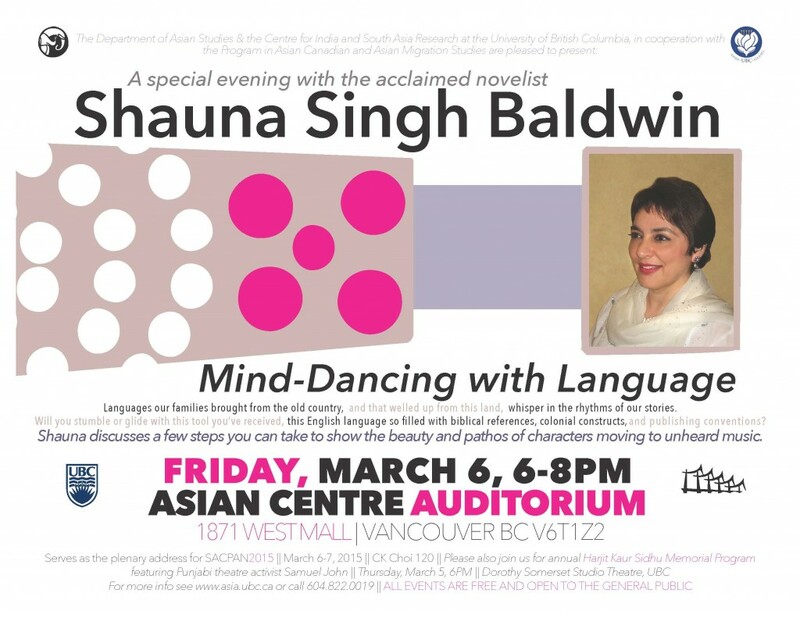 The Department of Asian Studies and the Centre for India and South Asia Research, in cooperation with the Program in Asian Canadian and Asian Migration Studies at UBC are thrilled to present: “Mind-Dancing with Language”: A special evening with the acclaimed novelist Shauna Singh Baldwin. Languages our families brought from the old country, and that welled up from this land, whisper in the rhythms of our stories. Will you stumble or glide with this tool you’ve received, this English language so filled with biblical references, colonial constructs, and publishing conventions? Shauna discusses a few steps you can take to show the beauty and pathos of characters moving to unheard music.